AbstractA series of monozygotic (MZ) twin pairs discordant for premature ovarian failure presented an unusual opportunity to study fresh ovarian transplantation. This unusual series then helped us to refine the techniques for both fresh and frozen ovary transplantation in order to preserve fertility for cancer patients who would otherwise suffer iatrogenic iatrogenic ovarian failure from their chemotherapy and radiation.Ten MZ twin pairs requested ovarian transplantation and nine of them have undergone fresh transplantation along with cryopreservation of spare donor ovarian tissue. Eight of them had a fresh cortical tissue transplant, and two of those eight received a second frozen–thawed transplant after the first transplant ceased functioning years later. One of the 9 MZ twins had a fresh whole ovary microvascular transplant rather than a cortical graft. 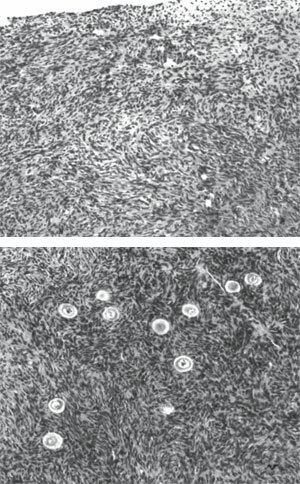 62 cancer patients had had ovarian tissue cryopreserved from 1997 till the present, and one thus far has had her frozen ovarian tissue transplanted back after she was cured and married, which was 12 years after her ovary had been frozen and she had undergone menopause from her bone marrow transplant.All recipients reinitiated ovulatory menstrual cycles and normal Day 3 serum FSH levels by 77–142 days. Seven of the nine fresh transplants have already conceived naturally (three of them twice), producing 9 healthy babies. One required IVF because she had congenital absence of ovaries and fallopian tubes, and delivered healthy IVF twins. Currently, eleven healthy babies (including two from frozen ovary transplants have been delivered out of 14 pregnancies in 10 patients, two of whom were the cancer cases. There is only one patient out of the ten that has not had a healthy pregnancy, but she was 40 years old when she first underwent the transplant. One successful fresh transplant ceased functioning by four years, but then this patient conceived again after a frozen–thawed secondary transplant. Another ceased functioning after two years, but again conceived after a frozen–thawed secondary transplant. There was no apparent difference in return of ovarian function between the nine fresh ovarian grafts and the three frozen grafts. Ovarian transplantation appears to restore ovulatory function robustly. Fourteen pregnancies, leading to 11 healthy babies, including two after cryopreservation, bode well for application of ovarian tissue freezing and transplan- tation to fertility preservation. A comparison of slow freeze technology to vitrification of ovarian tissue strongly favors vitrification. Successful fresh human ovary transplantation was first reported between monozygotic twins discordant for premature ovarian failure (POF) using a cortical grafting technique.1,2 We have now reported a total of nine consecutive successful fresh ovary transplants in menopausal women, with resumption of normal hormonal cycling and menstruation in all cases, and with 12 pregnancies and nine healthy babies born from these nine fresh ovary transplants.3-5 This experience helped us refine the techniques necessary for successful preservation of fertility for cancer patients using ovarian tissue freezing. It was remarkable to identify a MZ twin pair in which one sister had undergone menopause for unexplained reasons at age 14 years, whereas the other, aged 24, was still fertile with three naturally conceived children, as well as normal ovulatory cycles and ovarian reserve.1,3-5 After the sterile twin received a graft of ovarian tissue from her sibling, she conceived naturally after her first menstrual cycle, and delivered a healthy baby at full-term. This case of discordant twins is not unique, however, and nine other twin pairs have subsequently consulted our center for ovarian transplantation in preference to conventional oocyte donation. The present chapter provides a clinical evaluation of the nine cases of fresh ovarian transplantation that have already undergone surgery and its application then to 62 cases of ovarian tissue freezing for cancer and 3 cases of frozen ovary tissue transplantation.3,5,13,20-21 Furthermore, it delineates the expected duration of function of these cortical ovarian grafts, both fresh and frozen. Ten MZ twin pairs aged 24–40 years presented with discordant ovarian function, one sibling of each pair having undergone POF. Nine of the ten elected to undergo transplantation of an ovary from the normal twin to the twin with POF. POF was diagnosed after more than 4 years of amenorrhea accompanied by elevated serum levels of gonadotrophins, over 50 miu/ mL. Their sisters, in contrast, still had normal menstrual cyclicity, normal gonadotropin levels, and eight of the nine donors had successful pregnancy histories. None of the twin pairs was actively recruited. Each had enquired about treatment to restore normal reproductive endocrine function with fertile potential after hearing reports of the first successful ovarian transplant in a twin pair in 2005, as well as from researching an earlier testis transplant we had reported for anorchia.1,22,23 The patients volunteered many reasons for preferring transplantation to conventional oocyte donation. Many of them had previous failures with donor oocyte cycles, and did not want to go through more cycles. Some had the opportunity to donate an ovary at the same time as having surgery they required for other gynecologic problems (such as fibroids or cysts). All of them found the possibility of natural conception more attractive than IVF and egg donation. In most cases, the twins lived far apart (even in different countries) and the donors preferred to make a single visit for a one-time donation, with the hope that frozen banked tissue could serve as a backup if the first transplant failed. These studies were carried out with informed consent under a protocol approved by the Institutional Review Board and the Ethics Committee of St. Luke’s Hospital, St. Louis, MO. The donors were informed that they might reach menopause slightly earlier than normal based on theoretical models and experimental studies24,25 and were aware of the relative risks associated with unilateral oophorectomy. The reproductive history of each twin pair was reviewed and ovarian function was investigated by standard gynecological procedures. Serum from peripheral blood was prepared for immunoassay of FSH, LH and estradiol (E2) three days after the start of menses in women who were cycling naturally, but not on any specific day in those with POF. The antral follicle count (AFC) was recorded by transvaginal ultrasound scanning. A tiny piece of spare tissue becoming available during oophorectomy of the donor, as well as resected atrophied ovarian cortex of the recipient was prepared by fixation in Bouin’s fluid, embedding in paraffin, sectioning, and staining with haematoxylin and eosin (Figures 42.1A and B). Most of the spare donor tissue was cryopreserved for future use. DNA fingerprinting confirmed the genetic identity of all ten twin pairs, who were also screened for common genetic causes of POF. Peripheral lymphocytes were prepared as DNA for testing genetic polymorphisms at 15 loci (Paternity Testing Corporation, Columbia, MO), and cultures (and in some cases spare ovarian medullary tissue) were karyotyped by the G-banding technique and fluorescent in-situ hybridization. DNA was also screened for the number of CGG repeats in the FMR1 gene using Southern blot analysis or the polymerase chain reaction for fragile X syndrome.1 In addition, genomic DNA and lymphoblastoid cell lines were prepared for future genetic studies of all the twin pairs in the hope of one day identifying the loci responsible for premature ovarian failure (POF). Figures 42.2A to D: Steps in the procedure of ovarian transplantation between MZ twin sisters: (A) preparation of donor ovarian cortex by dissection in a Petri dish on ice; (B) Preparation of recipient ovarian medulla; (C) Attaching donor cortical tissue to recipient ovarian medulla; (D) Attaching thawed donor cortical tissue for re-transplant to the recipient. The patients were scheduled for surgery within two weeks of confirming negativity for the human immunodeficiency virus type 1 and hepatitis B and C viruses. Nine of the presenting identical twin pairs actually underwent the surgery. Under general anesthesia, one ovary was removed from donor using laparoscopy or minilaparotomy. For the eight undergoing cortical tissue harvesting (excluding the intact whole ovary case), the whole ovary was transferred to a Petri dish for dissection by hand with a scalpel and toothed forceps. It was felt important to prepare a cortical tissue slice no thicker than ~ 1.5 mm to facilitate rapid revascularization while keeping the tissue constantly irrigated with ice-cold Leibovitz L-15 medium (Figure 42.2A). We now recommend a special microtome tissue slicer rather than dissecting by hand, in order to get a thinner slice of only 0.75 mm. But for these initial fresh cases, the hand pared cortex was divided into three or four pieces of approximately equal size for grafting, one piece to each recipient ovary. The remaining one-half to two-thirds of the cortical tissue was cryopreserved in 1.5 M 1.2- propanediol and 0.2 M sucrose by slow freezing to liquid nitrogen temperatures.44,45 Remnants of the trimmed tissue were set aside for histology and genetic studies. The recipients were prepared by minilaparotomy via a 3.5 cm incision above the pubis. For cortical tissue transplantation, recipient ovarian cortex was resected to completely expose medullary tissue (Figure 42.2B); hemostasis was controlled with microbipolar forceps, and irrigation with heparinized saline was performed to avoid adhesion formation or a hematoma between donor and recipient tissues. The tissue graft was trimmed to the dimensions of the exposed surface of the recipient organ and attached using 9-0 interrupted sutures under an operating microscope (Figure 42.2C). Very importantly, the medullary bed was also sutured to the under surface of the cortical graft with 9-0 sutures to maintain tight tissue approximation again to avoid micro- hematoma formation under the cortical grafts. Irrigation and meticulous pinpoint hemostasis were rigorous to avoid adhesion formation. The same procedure was used for frozen–thawed tissue to replace the first graft that may have ceased to function (Figure 42.2D), and also for the cancer cases. After removing the first graft or the old cortex of the cancer patients, to accommodate the new one, all discarded tissue was prepared by histology and found to be completely devoid of follicles. All patients were released from the hospital the same day or the following morning, and had a rapid and uneventful recovery. In the one case of bilateral absence of ovary and ampulla, the graft was attached to the fallopian tube isthmus. Figures 42.3A to D: Steps in the procedure of intact ovary microvascular transplantation: (A) Depiction of donor oophorectomy; (B) Microsurgical isolation of donor ovary blood supply; (C) End-to-end anastomosis of ovarian blood vessel; (D) Completed anastomosis of ovarian artery and veins. To transplant an intact whole ovary, the donor ovary was removed by clamping the infundibular pelvic ligament at its base in order to obtain maximum length. The veins (3–5 mm) were easily identified, but the ovarian artery (0.3 mm) was not grossly visible. The entire specimen was placed in Leibovitz medium at 4°C and two veins and one artery were dissected and isolated under the operating microscope. Germinal vesicle oocytes were aspirated from antral follicles for in vitro maturation and vitrification at the metaphase II stage. Meanwhile, the recipient’s infundibular pelvic ligament was clamped at the base and transected close to her nonfunctioning ovary. 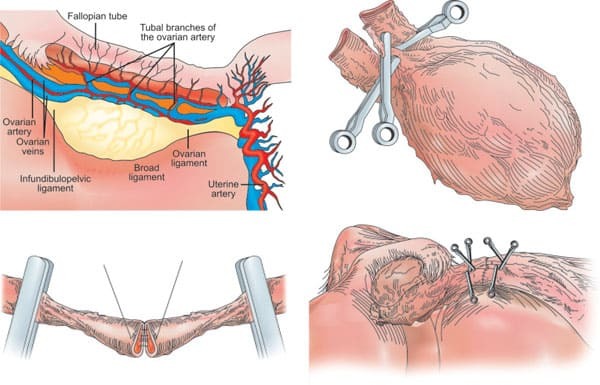 The donor’s ovarian veins were then anastomosed to the recipient’s with 9-0 nylon interrupted sutures, and the ovarian arteries were anastomosed with 10-0 nylon interrupted sutures (Figures 42.3A to D). When the microvascular clamps were removed, blood flow was observed by fresh bleeding from the surface of the ovary where a cortical slice had been taken for cryopreservation as a backup. Details on the original chorionicity at birth of these identical twin sisters were available for six of the ten twin pairs consulting our center. Two were monochorio- nic-diamniotic, one was dichorionic-diamniotic and three (50%) were monochorionic-monoamniotic, which was a surprisingly high incidence since the incidence of mono/mono is normally only ~ 2% (P< 0.0005). It is clear that late splitting, for whatever reason, predisposes otherwise identical twins to discordant germ cell deficiency. All nine twin pairs underwent orthotopic ovarian isotransplantation between April 2004 and April 2008. The recipients, for the most part, continued to cycle for over three years to six years or more, although two of them whose donor had low antral follicle counts (AFC) of less than 10, only functioned for 2 years. However, even these two cases had spare frozen cortical tissue that was available for further transplants. One has not yet done this, but in the other, the frozen transplant was successful, and so she also has now more than three years of ovarian function. Day 3 FSH levels returned to normal by 4.5 months of surgery in all cases (Figure 42.4A), soon after ovulation had recommenced (judging by the results of BBT or home ovulation detection kits monitored by the patients themselves). The refractory period for resuming menses after transplantation was 63–100 days, with the majority of subsequent cycles in the normal range of duration. Figure 42.4A: The eight fresh transplant cases showed a dramatic decline in day 3 serum FSH by 80–140 days post- operatively corresponding approximately to the resumption of menses. The results of the microvascular whole-ovary transplant are not significantly different from cortical grafts. The first case, a 25-year old recipient, became pregnant the first time after her second menses without medical assistance, and subsequently delivered a healthy baby girl in 2005 following an uneventful pregnancy. After nursing for several months, she resumed menses and during the seventh cycle conceived naturally a second time, but this pregnancy miscarried. Over three years after her transplant, she ceased cycling and hormone levels, which were measured monthly, became post-menopausal again (82 mIU/mL FSH, 34 mIU/mL LH and 13 pg/mL E2). After transplanting cryopreserved spare tissue, her hormones again returned to premenopausal levels after four months, a delay identical to her fresh transplant (Figure 42.4B). She conceived again without any intervening menses and without any medical treatment approximately five months after her re-transplant and delivered another healthy baby. The second case became pregnant at 39 years of age without medical assistance after her fifth menses, eight months after transplantation. She too delivered a healthy baby girl at full-term. She then conceived again at age 41, and delivered a healthy baby boy, again at full-term. Her ovary is still functioning to date after six years. Only one patient failed to conceive, but she had a marginal AFC and was 41 years old at the time of the transplant. However, the ovary continued to function despite her age for over four years. One case had a microvascular transplant and is continuing to cycle regularly. Her Day 3 FSH and LH fell to the lowest levels of all the recipients (3.4 and 0.4 mIU/mL, respectively), and her post-operative ultrasound appeared normal. She became pregnant and delivered a healthy baby two years later. All patients remain pleased with their decision to have undergone transplantation, and even the patient requiring IVF preferred this option. Overall, there have been fourteen pregnancies and ten healthy live births in this group of nine transplants. Since 1996, we have frozen ovary tissue for 62 young women with solid organ cancer, or with great risk for POF, of whom 16 had spare frozen tissue subjected to detailed viability testing before cryopreservation and after thaw. All 62 had histologic review, and only one had evidence of ovarian metastasis, a young woman with breast cancer. With the classical slow freeze technique, only 41% of oocytes survived the thaw.20,21,26,27 However, with vitrification there was no difference between fresh unfrozen controls and frozen tissue.21 It seemed likely, therefore, that vitrified ovarian tissue would give better results after transplantation than tissue cryopreserved by slow-freeze. It is naturally to be expected that it could be a decade or more before patients with frozen tissue come back to have it thawed and re-implanted. Firstly, they need to see if they are declared “cured” by their oncologist, and secondly, in the modern era, it could be a while before they meet the right partner and decide to have children. Thus, far, only 3 of our patients have had their frozen tissue transplanted back. In two cases, the tissue was cryopreserved with slow freeze and, in one case, with vitrification. The method we use for vitrification of ovarian tissue has already been described in detail,21 but to summarize: Using a “Cryotissue” knife and silicone template, a 3/4 mm deep slice is taken off the cortical surface of the ovary, measuring centimeter wide by two centimeters long. Then similar cortical slices are removed from the surface of the rest of the ovary, and usually 10 to 16 slices can be obtained. The cortical slices are placed in a large test tube containing 7.5% ethylene glycol and 7.5% DMSO in HEPES buffered media containing 20% synthetic serum substitute for 25 minutes. This is called ES, or equilibrium solution. The thin tissue slices are then transferred to a large test tube containing 20% ethylene glycol, 20% DMSO, and 0.5 molar sucrose, and kept there until the tissue slices sink to the bottom, which is usually less than 15 minutes. They are then blotted dry and placed on a perforated copper grid (Kitazato, Japan), and plunged directly into liquid nitrogen. A protective cover is then screwed on and the vitrified tissue is transferred to a liquid nitrogen storage tank. The speed of cooling and warming is approximately 20,000 degrees centigrade per minute, and successful vitrification is easily observed by the absence of ice crystal formation on the tissue. For thawing, the copper grid is plunged into a large test tube containing thaw media at 37°C for 5 minutes. Thaw media contains 1.0 molar sucrose. The tissue then is transferred to 0.5 molar sucrose at room temperature for 5 minutes following which it is transferred to standard isotonic HEPES buffered transfer media. The technique for transplantation of the thawed tissue is no different from that which we described for fresh tissue. Of the three cases of frozen transplanted tissue thus far, all have had a robust return of ovulatory menstrual cycles with spontaneous pregnancy, but the case with vitrified tissue had the quickest return of function with her first period occurring at just 42 days post transplant. Including the first MZ twin pair presenting for ovarian transplantation in 2004, there have been eight more comparable cases using fresh ovary so far. There have been three additional frozen cases, for a total of twelve auto- or homo-transplants. The MZ twin cases characterized by ovarian discordancy, a phenomenon that is not as rare as first assumed.28 The ovaries with POF were diminutive, fibrous and completely lacking follicles at any stage, while serum gonadotrophins were correspondingly elevated and E2 was low. None of the medical histories provided an explanation for POF with afollicular ovaries in the recipients, except for one who had received chemotherapy. The clinical histories of POF in the other nine MZ cases were idiopathic and consistent with congenital deficiency of germ cells. According to a mathematical model,25 the follicle reserve at birth must be very small to account for POF as early as adolescence or young adulthood. Conventional oocyte donation is the first line of treatment for patients with POF who want to become pregnant. Nevertheless, the robust results obtained in every case of this series of isogenetic twins gives confidence in ovarian transplantation as an alternative strategy for overcoming sterility. Although the surgery might seem more burdensome than oocyte retrieval, it is a straightforward and uneventful outpatient procedure, which has been effective in all nine cases in restoring menstrual cycles and enabling establishment of viable pregnancies. It has been equally uneventful in the three frozen cases. After ovarian transplantation, the patients were able to attempt natural conception every month without medical assistance. Accepting the risks of surgery, the procedure avoids the specific risks associated with IVF, notably ovarian hyperstimulation syndrome and multiple pregnancy, and moreover, allows spare tissue to be cryopreserved in the event of graft failure. 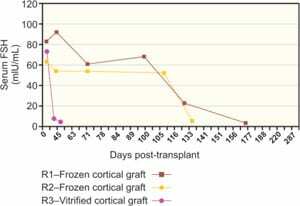 The number of successful re-transplants will depend on the age of the patient and the number of follicles surviving, but the results of fresh and frozen cortical tissue from the first few patients suggest that fertile potential may be restored cumulatively for over fifteen years by serial transplantation. Ovarian cortical grafting was chosen for eight of the procedures in preference to vascular anastomosis of the intact ovary because it is less invasive, carries minimal operative risk and reduces recovery time. The peripheral location of primordial follicles is advantageous for rapid revascularization, as well as for successful cryopreservation.1-4,38-40 The thinner slices used for vitrification may also allow for more rapid revascularization than the thicker slices used in earlier efforts. Heterotopic sites have produced no successful pregnancies to date and our patients preferred the chance of natural conception.42-45 The whole-ovary microvascular approach was adopted at one patient’s request in the hope of maximizing the functional longevity of her transplant.41 We suspect follicle ischemia was minimal, as predicted from transplants of intact rat ovaries using vascular anastomosis.6 However, the long duration of function of our ovarian cortical grafts suggest that ischemia may not be problematic if very thin cortical slices are used. At the time of this writing, we are only aware of a small number of other births or ongoing pregnancies after re-implanting frozen ovarian tissue, and these were all for cancer patients.39,40,51-54 This is not surprising for a new procedure involving patients who must delay transplantation until they are assured of long-term remission or await confirmation that their frozen tissue is free of malignant cells. We had no such concern in our series, which offers a better chance to rapidly evaluate this technique in both fresh and frozen grafts from the same individual. No such concerns applied to the healthy twins, and the evidence from this series of the effectiveness of both fresh and frozen transplants gives hope that cryopreserved ovarian tissue for cancer patients should no longer be considered experimental. Silber SJ, Lenahan KM, Levine DJ, Pineda JA, Gorman KS, Friez MJ, et al. Ovarian transplantation between monozygotic twins discordant for premature ovarian failure. The New England Journal of Medicine 2005; 353:58-63. Gosden RG, Baird DT, Wade JC, Webb R. Restoration of fertility to oophorectomized sheep by ovarian autografts stored at –196 degrees C. Human Reproduction (Oxford, England) 1994;9:597-603. Silber SJ, Gosden RG. Ovarian transplantation in a series of monozygotic twins discordant for ovarian failure. The New England Journal of Medicine 2007;356:1382-4. Silber SJ, DeRosa M, Pineda J, Lenahan K, Grenia D, Gorman K, et al. A series of monozygotic twins discordant for ovarian failure: ovary transplantation (cortical versus microvascular) and cryopreservation. Human Reproduction (Oxford, England) 2008;23:1531-7. Silber SJ, Grudzinskas G, Gosden RG. Successful pregnancy after microsurgical transplantation of an intact ovary. The New England Journal of Medicine 2008;359: 2617-8. Coulam CB, Adamson SC, Annegers JF. Incidence of premature ovarian failure. Obstetrics and Gynecology 1986;67:604-6. Riboli E, Hunt KJ, Slimani N, Ferrari P, Norat T, Fahey M, et al. European Prospective Investigation into Cancer and Nutrition (EPIC): study populations and data collection. Public Health Nutrition 2002;5:1113-24. Luborsky JL, Meyer P, Sowers MF, Gold EB, Santoro N. Premature menopause in a multi-ethnic population study of the menopause transition. Human Reproduction (Oxford, England) 2003;18:199-206. Goswami D, Conway GS. Premature Ovarian Failure. Human Reproduction Update 2005;11:391-410. Snieder H, MacGregor AJ, Spector TD. Genes control the cessation of a woman’s reproductive life: a twin study of hysterectomy and age at menopause. The Journal of Clinical Endocrinology and Metabolism 1998;83:1875-80.
de Bruin JP, Bovenhuis H, van Noord PA, Pearson PL, van Arendonk JA, te Velde ER, et al. The role of genetic factors in age at natural menopause. Human Reproduction (Oxford, England) 2001;16:2014-8.
van Asselt KM, Kok HS, Pearson PL, Dubas JS, Peeters PH, Te Velde ER, et al. Heritability of menopausal age in mothers and daughters. Fertility and Sterility 2004;82: 1348-51. Bleyer WA. The impact of childhood cancer on the United States and the world. CA Cancer 1990;40:355-67. Ries LAG. Cancer incidence and survival among children and adolescents: United States SEER program 1976-1995. 1999. Jeruss JS, Woodruff TK. Preservation of fertility in patient with cancer. N Engl J Med 2009;360:902-11. Anderson RA, Themmen AP, Al-Qahtani A, Groome NP, Cameron DA. The effects of chemotherapy and long-term gonadotrophin suppression on the ovarian reserve in premenopausal women with breast cancer. Hum Reprod 2006;21:2583-92. Anderson RA, Cameron DA. Assessment of the effect of chemotherapy on ovarian function in women with breast cancer. J Clin Oncol 2007;25:1630-1. author reply 1632. Larsen EC, Muller J, Schmiegelow K, Recnitzer C, Andersen AN. Reduced ovarian function in long-term survivors of radiation and chemotherapy-treated childhood cancer. J Clin Endocrinol Metab 2003;88:5307-14. Lee SJ, Schover LR, Partridge AH, Patrizio P, Wallace WH, Hagerty K, et al. American Society of Clinical Oncology. American Society of Clinical Oncology recommendations on fertility preservation in cancer patients. J Clin Oncol 2006;24:2917-31. Silber S, Kagawa N, Kuwayama M and Gosden R. Duration of fertility after fresh and frozen ovary transplantation. Fertility Sterility 2009;doi: 10.1016/ j.fertnstert.2009.12.073. Kagawa N, Silber S, Kuwayama M. Successful vitrification of bovine and human ovarian tissue. Reprod Biomed Online 209;18:568-77. Bedaiwy MA, Falcone T. Harvesting and autotransplantation of vascularized ovarian grafts: approaches and techniques. Reproductive Biomedicine Online 2007;14: 360-71. Silber SJ. Transplantation of a human testis for anorchia. Fertility and Sterility 1978;30:181-7. Gosden RG, Telfer E, Faddy MJ, Brook DJ. Ovarian cyclicity and follicular recruitment in unilaterally ovariectomized mice. Journal of reproduction and fertility 1989;87:257-64. Faddy MJ, Gosden RG, Gougeon A, Richardson SJ, Nelson JF. Accelerated disappearance of ovarian follicles in mid-life: implications for forecasting menopause. Human Reproduction (Oxford, England) 1992;7:1342-6. Newton H, Aubard Y, Rutherford A, Sharma V, Gosden R. Low temperature storage and grafting of human ovarian tissue. Human Reproduction (Oxford, England) 96;11:1487-91. Gook DA, Edgar DH, Stern C. Effect of cooling rate and dehydration regimen on the histological appearance of human ovarian cortex following cryopreservation in 1, 2-propanediol. Human Reproduction (Oxford, England) 1999;14:2061-8. Gosden RG, Treloar SA, Martin NG, Cherkas LF, Spector TD, Faddy MJ, et al. Prevalence of premature ovarian failure in monozygotic and dizygotic twins. Human Reproduction (Oxford, England) 2007;22:610-5. Dueck A, Poenaru D, Jamieson MA, Kamal IK. Unilateral ovarian agenesis and fallopian tube maldescent. Pediatric Surgery International 2001;17:228-9. Su LL. Monoamniotic twins: diagnosis and management. Acta Obstetricia Et Gynecologica, Scandinavica 2002;81:995-1000. Weksberg R, Shuman C, Caluseriu O, Smith AC, Fei YL, Nishikawa J, et al. Discordant KCNQ1OT1 imprinting in sets of monozygotic twins discordant for Beckwith-Wiedemann syndrome. Human Molecular Genetics 2002;11:1317-25. Oktay K, Economos K, Kan M, Rucinski J, Veeck L, Rosenwaks Z. Endocrine function and oocyte retrieval after autologous transplantation of ovarian cortical strips to the forearm. 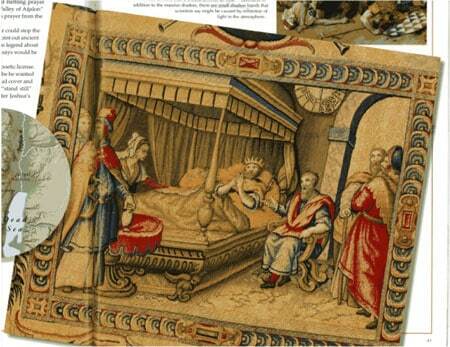 JAMA 2001;286:1490-3. 1994;9:597-603. Salle B, Demirci B, Franck M, Rudigoz RC, Guerin JF, Lornage J. Normal pregnancies and live births after autograft of frozen-thawed hemi-ovaries into ewes. Fertility and Sterility 2002;77:403-8. Meirow D, Levron J, Eldar-Geva T, Hardan I, Fridman E, Zalel Y, et al. Pregnancy after transplantation of cryopreserved ovarian tissue in a patient with ovarian failure after chemotherapy. The New England Journal of Medicine 2005;353:318-21. Hilders CG, Baranski AG, Peters L, Ramkhelawan A, Trimbos JB. Successful human ovarian autotransplantation to the upper arm. Cancer 2004;101:2771-8. Kim SS, Hwang IT, Lee HC. Heterotopic autotransplanta- tion of cryobanked human ovarian tissue as a strategy to restore ovarian function. Fertility and Sterility 2004;82: 930-2. Oktay K, Buyuk E, Veeck L, Zaninovic N, Xu K, Takeuchi T, et al. Embryo development after heterotopic transplantation of cryopreserved ovarian tissue. Lancet 2004;363:837-40. Rosendahl M, Loft A, Byskov AG, Ziebe S, Schmidt KT, Andersen AN, et al. Biochemical pregnancy after fertilization of an oocyte aspirated from a heterotopic autotransplant of cryopreserved ovarian tissue: case report. Human Reproduction (Oxford, England) 2006;21:2006-9. Wang X, Chen H, Yin H, Kim SS, Lin Tan S, Gosden RG. Fertility after intact ovary transplantation. Nature 2002;415:385. Gougeon A. Dynamics of follicular growth in the human: a model from preliminary results. Human Reproduction (Oxford, England) 1986;1:81-7. Donnez J, Martinez-Madrid B, Jadoul P, Van Langendonckt A, Demylle D, Dolmans MM. Ovarian tissue cryopreservation and transplantation: a review. Human Reproduction Update 2006;12:519-35. Armenti VT, Radomski JS, Moritz MJ, Philips LZ, McGrory CH, Coscia LA. Report from the National Transplantation Pregnancy Registry (NTPR): outcomes of pregnancy after transplantation. Clinical Transplants 2000:123-34. Andersen CY, Rosendahl M, Byskov AG, Loft A, Ottosen C, Dueholm M, et al. Two successful pregnancies following autotransplantation of frozen/thawed ovarian tissue. Human Reproduction (Oxford, England) 2008;23:2266-72. Demeestere I, Simon P, Emiliani S, Delbaere A, Englert Y . Fertility preservation: successful transplantation of cryopreserved ovarian tissue in a young patient previously treated for Hodgkin’s disease. The Oncologist 2007;12:1437-42. Sanchez-Serrano M, Crespo J, Mirabet V, Cobo AC, Escriba MJ, Simon C, et al. Twins born after transplantation of ovarian cortical tissue and oocyte vitrification. Fertil Steril 2010;93:268.e11-3. Piver P, Aniot C, Agnani G, Pech JC, Rohrilich PS, Vidal F, et al. Two pregnancies obtained after a new technique of autotransplantation of cryopreserved ovarian tissue. Hum Reprod 2009;24:10-35.